NuMedica DHEA is a potent supplement noted for its vital hormone. 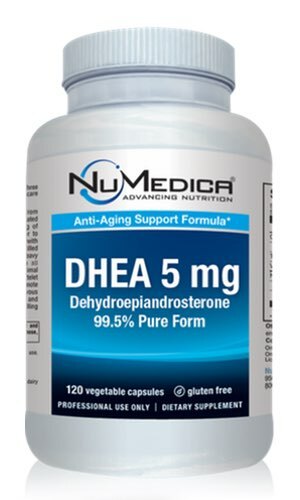 DHEA has been dubbed the "mother hormone" because it can convert to other hormones that may be needed in your body such as estrogen, testosterone, and progesterone. Because the body begins to decrease hormone production as you age, many people find that taking a hormone supplement provides them with the hormonal balance they need. 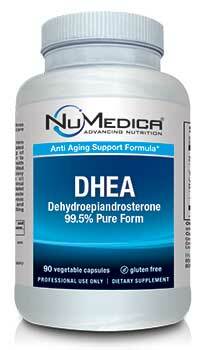 NuMedica's DHEA contains 99.5% pure hormone and is vegetarian friendly. Why Take a DHEA Supplement like NuMedica DHEA? Because DHEA production tends to reach its peak during a person's mid-twenties, many people find that taking a DHEA supplement prevents their hormonal supply from decreasing. As hormones like estrogen and testosterone decrease, the addition of DHEA supplement insures that your body has the hormonal balance it had in earlier years. Some scientists believe that DHEA can help stave off the aging process, increase energy, support the adrenal gland, boost the immune system, and even enhance memory and mood. Age isn't the only factor that can lead to a decrease in your body's hormones. Studies demonstrate that factors like illness, alcohol, smoking, caffeine intake, and even nutritional deficiencies can impact your hormone levels. If you've endured a recent bout of stress, your hormone production could also be at risk. By taking a powerful formula like NuMedica DHEA, you can more effectively ensure that your hormone production remains balanced. DHEA is particularly exciting to researchers who are still working to unravel all of its health secrets. With its ability to convert to other hormones that are specifically needed by your body, this supplement has become a popular option. Yet another unique feature of DHEA is its apparent ability to keep the hormone cortisol in check. Cortisol increases as you age and is linked to stress, which can negatively impact your body and its systems. With the optimum level of DHEA in your system, you can more effectively keep cortisol production at bay.